Delicious Opera cake with almond sponge joconde, coffee syrup, coffee buttercream, Chocolate ganache, and Chocolate glaze. We went to beach this Saturday, my kids and hubby played in the water, and for a while I sat on the beach and enjoyed the breeze. Later as the sun was setting I loved wading through the waters; yes that is my hobby while in beach. On the way back we had some Mac Donald’s treat; it was late night when we reached home. So I didn’t make anything on Saturday. Opera cake was on the do to list as it was challenge for this month. I got a chance to make them only yesterday. Making an opera cake is a laborious process. You need to follow of lot of steps to get the final product. Still I made opera cake as I wanted to learn new techniques. I got to learn about almond Sponge Joconde and French coffee butter cream. This month’s Baking Partner’s challenge was suggested by Savita of Savitha’s kitchen. It is a very rich cake, and may be reason why it is served in bite size version. Even bite size version is rich. If you are calorie counting guy then this cake is not recommend for you. This Opera cake was created by French Pastry Chef Cyriaque Gavillon who worked at the legendary Dalloyau shop in Paris. It was the perfect match. Cyriaque, a genius with patisserie and an artist who created the most amazing cakes and sugar decorations, and Dalloyau joined hands. 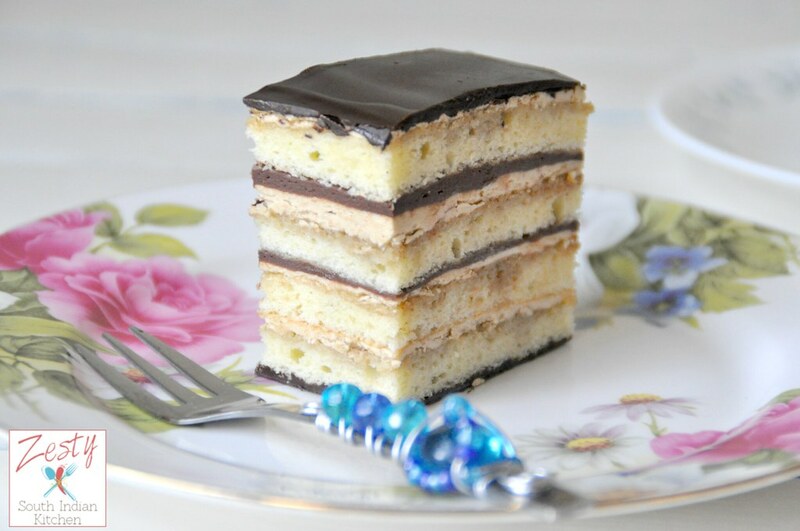 In 1955, when inventing the Opera cake he wanted to make something that in taking one bite, would give a taste of the whole cake. He worked on layers and tastes and came up with a wonderfully sophisticated cake. His wife told him it reminded her of the Paris Opera House, Palais Garnier. The name got stuck and he named it Opera cake. Opera cake is rectangular cake made of three layers of Joconde almond flavored sponge soaked in coffee syrup and topped with coffee butter cream and chocolate ganache. The top is covered with a deep dark chocolate icing. You can make chocolate ganache with bitter chocolate if you want. I used chocolate glaze with bitter sweet chocolate. Chocolate ganache with semi sweet chocolate. also I cut them into 4 pieces instead of traditional 3 layers.Traditionally the cake is decorated with its name written in glaze across the top and finished with piece of shimmering gold leaf. As I mentioned earlier, it is rich cake, and since I am the only person going to eat this cake, I was afraid of using 12 eggs in a recipe so used another one which uses only 4 however, there is butter and sugar and is rich. As the creator of cake tied this cake in bite sized form, that way it is good for you. Actually I combined both recipes, thus used techniques from both. Even though it is time taking cake it is delicious and rich. Give it try. I learned making French butter cream with hot sugar syrup. When I first mixed it looked like a soup, and thought what a mess I created. I did later find out that beating some more time makes everything perfect. 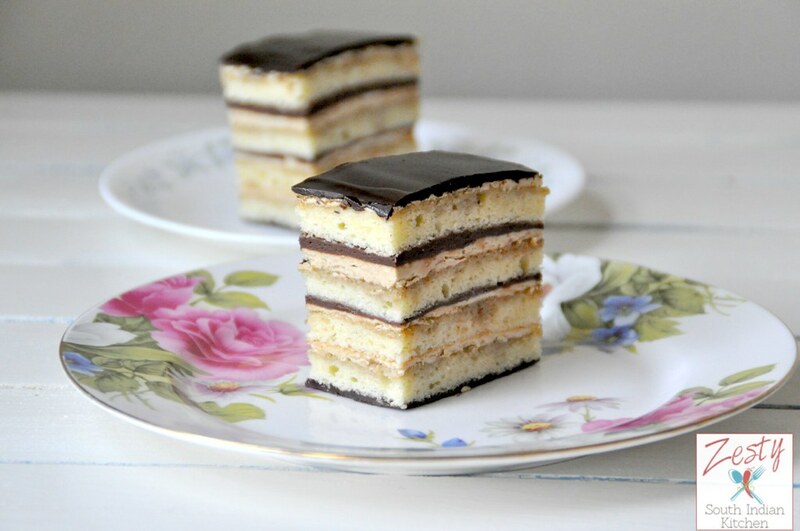 Here is the recipe for gorgeous opera cake for you. Please make sure to look at the other baking partner’s creations too, if you want to join, please shoot an e-mail, you can bake with us next month. Delicious opera cake made with almond joconde sponge, coffee buttercream, coffee syrup, chocolate ganache and chocolate glaze. Put oven rack in middle position and preheat oven to 425°F. Butter baking pan, 13x9 nch then line bottom with a sheet of parchment or wax paper,s, and generously butter paper. at medium speed until foamy.
. Add granulated sugar, then increase speed to high and beat until whites just hold stiff peaks. If you hold the pan upside it won't fall. Wash and clean the kitchen aid bowl and beat whole eggs in a large bowl high speed until eggs have tripled in volume and form a ribbon when beaters are lifted, 2 to 3 minutes. Reduce speed to low, then add almond flour and confectioners’ sugar and mix until just combined. To this add melted butter and mix in. Resift cake flour over batter and gently fold in. and then fold in remaining whites gently but thoroughly. then pour batter evenly into baking pan, spreading gently and evenly with offset spatula and being careful not to deflate (batter will be about 1/4 inch thick). Leave the baked sponge for 1 minute and free the sides gently with knife and tilt and transfer the sponge into another parchment paper. Gently peel of the parchment paper. Trim outside edges slightly, then carefully transfer one piece to new parchment paper. Stir together espresso powder and 1 tablespoon water until powder is dissolved. Bring sugar and remaining 3/4 cup water to a boil in a 1- to 2-quart heavy saucepan, stirring until sugar is dissolved. Reduce heat and simmer syrup, without stirring, 5 minutes.then add coffee mixture. your coffee syrup is ready. Stir together espresso powder and 1 tablespoon water until powder is dissolved. Bring sugar and remaining 1/4 cup water to a boil in a very small heavy saucepan, stirring until sugar is dissolved. Boil, without stirring, washing down any sugar crystals on side of pan with a pastry brush dipped in cold water, until syrup registers 238°F on thermometer (soft-ball stage;). While syrup boils, beat yolks in a large bowl with cleaned beaters at medium speed 1 minute. then add coffee mixture and beat until completely cool, 3 to 5 minutes. Beat in butter, 1 piece at a time, and beat until thickened and smooth. It will be soupy mixture at first, Upon beating it will becomes thicken to form buttercream structure. Melt butter and all but 2 tablespoons chopped chocolate in a double boiler or in a metal bowl set over a saucepan of barely simmering water, stirring occasionally, until smooth. Remove top of double boiler and stir in remaining 2 tablespoons chocolate until smooth, then cool glaze until room temperature but still liquid. Heat chocolate and cream in a microwave safe bowl. Then peel the parchment and turn chocolate side down, this make it easy handling of cake while cutting. Spread half of buttercream evenly over top with cleaned offset spatula, spreading to edges. then brush with half of remaining coffee syrup. Spread chocolate ganche evenly over top, spreading just to edges. Top with remaining cake square and brush with remaining coffee syrup. Spread remaining buttercream evenly over top, spreading just to edges. Chill cake until buttercream is firm, about 30 minutes. Repeat this process until you finish entire piece. Reheat remaining glaze over barely simmering water just until shiny and spreadable (but not warm to the touch), about 1 minute. Pour all but 1 tablespoon glaze over top layer of cake and spread evenly just to edges. If you want decorating the top of cake scrape remaining tablespoon glaze into seal able plastic bag and twist bag so glaze is in 1 corner. Snip a tiny hole in corner and decorate cake (leave a 1/2-inch border around edges).
. Chill cake until glaze is set, about 30 minutes, then trim edges slightly with a sharp serrated knife. Looks awesome Swathi… I wish I could taste one slice..will definitely try this someday..
Amazing really… lot of work but worth the effort! Nalini Somayaji recently posted…Amtekai Gojju (Indian Hog Plum Curry). 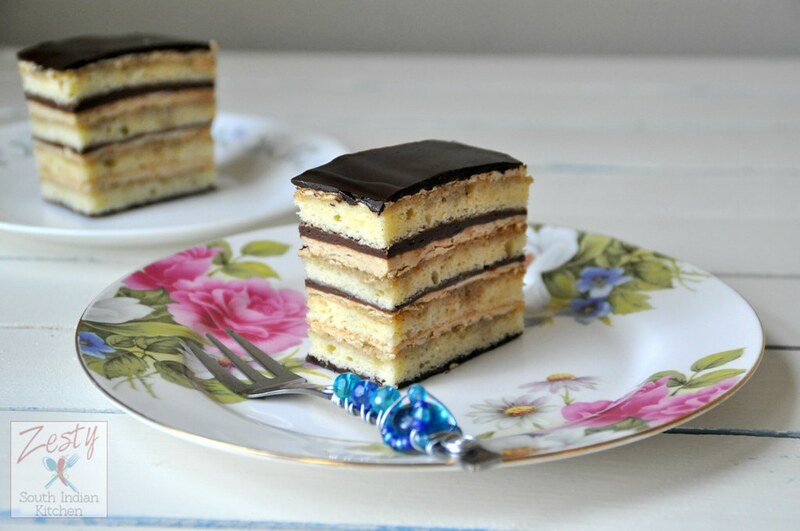 Delicious and gorgeous looking opera cake! Lovely share, Swathi! Wow spectacular….opera cake is just excellent..Appreciate U for making such a wonderful cake. Looks soooooo good. Lots of patience needed to make this opera cake.Cake looks really delicious.Loved your step by step pics as well. This cake is quite a masterpiece !! Cake looks rich and creamy. very tempted! Opera cake looks fabulous.. Looks very delicious and tempting. Very well explained recipe with pics.. no one can go wrong while trying out. WOW Swathi I have always wanted to make Opera Cake! To me it seems like it would take ALL day to bake! Pinned and shared and hope you will share it at the Say G’day Party underway! Yes Joanne, but in the end it worth all the efforts, delicious. Swathi, I adore opera cake! I agree with you it is a time-consuming process, but it is worth all the effort! Yours looks incredibly pretty! The photo is beautiful as well! Chapeau bas, dear friend, for sucha wonderful post! Pinning !